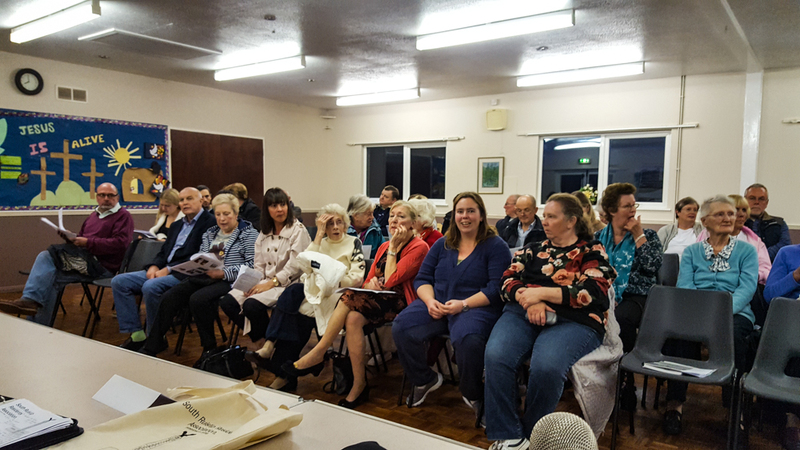 Lively meeting on Wednesday with updates from our local Police, a comprehensive presentation from HS2 representatives and Sqn Ldr Tenniswood from RAF Northolt. Quarterly Meeting Held at St Mary’s Church On Wednesday 23rd January 2019. Reports: Chairman, Treasurer, CRS, Secretary. Vice Chairman Sid Jackson chaired and opened the meeting at 8pm. Sid welcomed everyone to the meeting. Sid introduced the new constitution which was printed off and distributed with 50 copies for voting at the AGM. Sid distributed copies of the updated constitution for members to read which includes a section on diversity and inclusion. PC & PCSO Anne-Marie talked through the crime figures as attached. 226 crimes. Anne-Marie highlighted break-in of motor vehicles being high and preventable. Burglary higher at the moment – with thieves attracted by new goods from Christmas. Be secure – put on a radio in the day as well as timer lights. Discussed the benefits of Smart Water in use of crime prevention. Current account £451.90 and deposit £13,378.75. Income and expenditure will be published for 2018 at the AGM next meeting. Please with the number of RS’s and only one more RS sought. Presentation from Grant Blowers, engagement Graham Dean Power Supplies. 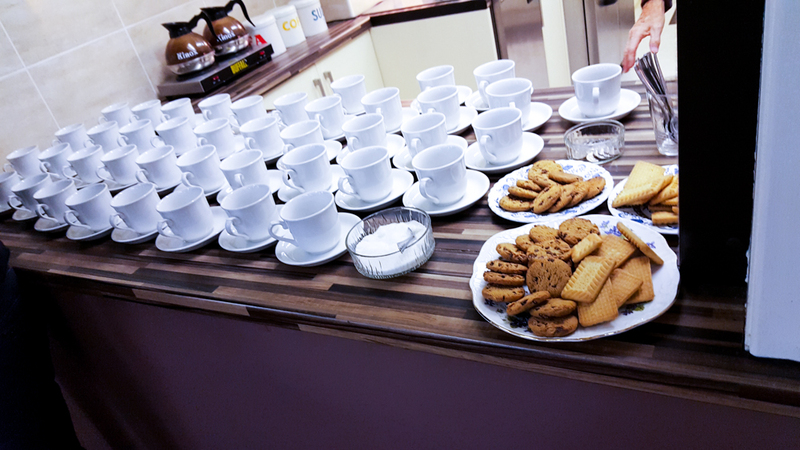 The engagement team are to engage with local councillors, residents associations, residents etc. They are getting more staff to deal with issues. They will hold drop-in clinics every week in the area (although not in S Ruislip). Recommended residents to sign up to www.hs2inhillingdon.commonplace.is There is also a help desk 08081 434 434. Stan on the Tunnel Boring Machine (TBM). The main issue is the electricity requirement which will come from a substation at North Harrow. Stan provided an update on the Power Supply route which needs to be dug to supply the electric. Needs a heavy power supply 33kv and 20MVA (1MVA powers 250 domestic properties). The cable will power the lighting and ventilation post build. The route will go along residential streets as will minimise disruption vs main roads which they were considering. They will dig a trench approx. 1.5m x 1.6m holding the cables. Roadworks in affected roads will last from 2 to 4 weeks. Rushdene Road, Deane Croft Road, Meadow Way, Hawthorne Avenue, Lime Grove, Myrtle Avenue, The Uplands, Westholme Gardens, Manor Way, Midcroft and Ickenham Road. Work to start Q3 2019 and will last around a year on the cable route. The drilling of the tunnels will start on West Ruislip and head to Old Oak Common. Matthew. Putting a team in place at the moment and turn HS2 scheme into a more detail focused piece of work and they will seek planning permission from the borough councils for the required permits and work. Talked through next stages such as earthworks (2020-2023), civil engineering projects (2019 to 2025) and the railway installation 2024 to 2026. TBM set to launch around 2021 from West Ruislip. Discussed the work and impact. There is an impact agreement to minimise disruption to traffic though they will close lanes etc. Discussed the vent shaft at South Ruislip. Any air quality monitoring on the roads due to the lorry movements? Not from HS2 representatives. This is done by the local authority (Hillingdon). They will be using Euro 6 lorries to minimise environmental impact (this is a most recent vehicle requirement). Pressure from the meeting on the councils to monitor. Noise from the vent shaft? Designed not to do that with fans to cool the tunnel and mitigate the noise. What is the vent shaft diameter? They would confirm later. Cllr Kauffman raised concern re the lorry movement along busy roads and the damage caused. We will invite people from HS2 again to speak later in the year. The update was appreciated. It needs resurfacing, last done in 1977. Needs to be repaired to continue as a military airport. The runway will close between April and October. It will be dug out completely and will be drained properly and improve the arrester beds. Work delayed as the previous contractor was Carrillian who went into receivership. The runway will remain the same size but at pains to point out it might look slightly longer due to the increased size of the arrester bed. How will the closure affect the air traffic at the site? They will operate operation Bolthole. Flights Rotary will come in. Fixed wing will move to RAF Benson who will be flown to there via helicopter. Commercial flights will move elsewhere but will resume post build. Dept of Transport mandated requirement to get improved use from the air space. Use old technology at the moment and will use GPS to make faster routes. RAF Northolt will be doing the same exercise later in the year. RAF Northolt won’t be affected by Heathrow’s proposed plan. Phone in sightings. Follow the drone code. 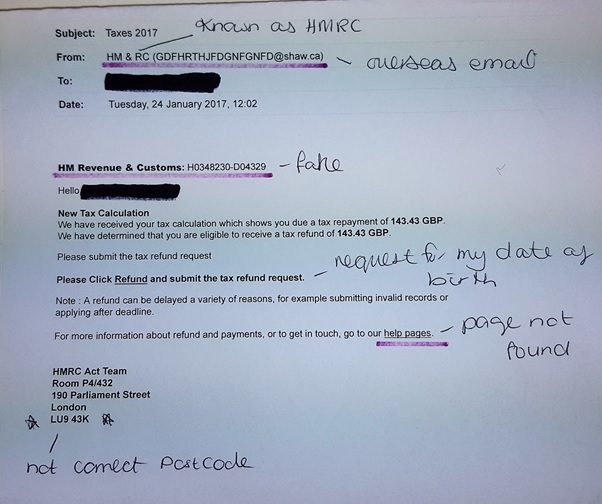 Sid wrote to the council. There is a lack of people stopping and a couple of complaints locally. Anything we can do to improve matters. Got an email back from the Traffic Team with a photo on a clear day and no buses present and how to use the zebra crossing is used. Sid was disappointed. The culvert at Lidl site on Victoria Road is being improved. Keen to make the crossings more visible. Concern raised re the length of time waiting for crossings to change when initially pressed. A number of consultations have taken place and have put in another from Victoria Road to the Black Bull to keep the traffic moving. Purely traffic management only. Minutes can be found here! There was plenty going on with the police and updates from the ward councillors. With government cuts, there is a proposal to reduce the number of councillors across Hillingdon from 65 to 53. This means there will be a balancing of wards across the borough to make for roughly 4200 citizens per councillor in Hillingdon. Whilst some wards are unchanged some will disappear and some will go down to two councillors. What does this mean for South Ruislip? The proposal is that South Ruislip would retain three councillors and grow taking the roads currently in Cavendish ward such as Torcross, Queens Walk, Mount Pleasant, Hunters Hill. The exception is Parkfield Crescent which would move to an adjacent Hillingdon ward. Parkfield aside, this makes sense with the Yeading Brook being a natural barrier. The ward will fit better with the area the SRRA covers so makes sense to us. But having been established in 1939 we have seen our fair share of boundary changes and as these wax and wane the area we cover remains the same. However, Cavendish ward will disappear with sections of it going to different expanded wards such as South Ruislip, the Manor and Eastcote. On a personal note I can’t help but feel for the uncertainty that respected established Cllrs in Cavendish such as Cllr Lavery and Barnes will face but such is politics. McDonalds South Ruislip: The SRRA are leading objections! McDonald’s have applied for planning permission for a new restaurant in the front of the car park for DFS and Curry’s adjacent to the Homebase/Argos car park on Victoria Road. If you agree sign our online E-petition which is managed by Hillingdon Council and so becomes part of the planning hearing process. LBH don’t make it easy to sign but please persevere. Monday 27th November the Christmas lights were turned on in South Ruislip. 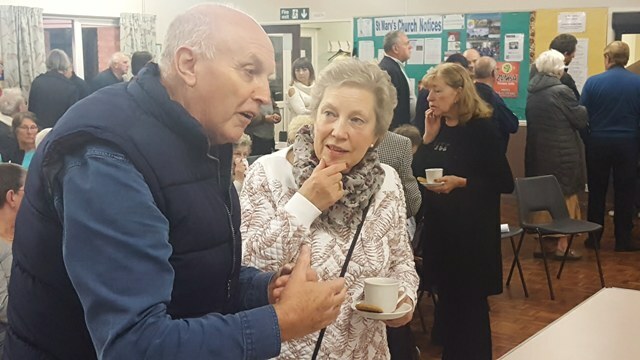 Some of the many attending included Councillors Judy Kelly and Allan Kauffman, representatives from local business and member of the SOuth Ruislip Chamber of Commerce, Sid Jackson from the SRRA and other local residents. Boundary Commission Change – Uxbridge and Hillingdon – latest update! The Boundary Commission have responded with changes to the constituency of Uxbridge and Hillingdon (note the change in name from Uxbridge and South Ruislip) by moving Harefield to the Ruilsip and Pinner constituency and adding more of Ruislip to the constituency. The controversial move to include two Ealing Council Northolt Wards in the revised Uxbridge and Hillingdon constituency remains unchanged. 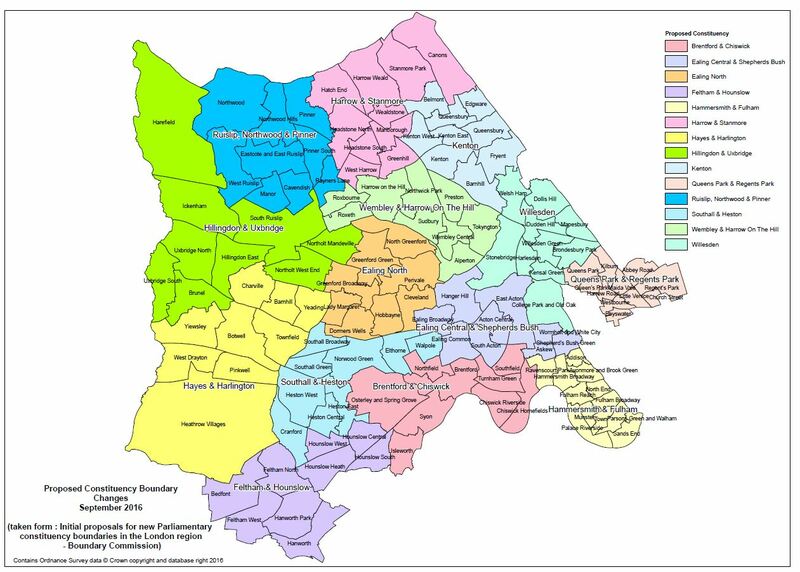 Maps of the proposed new Uxbridge and Hillingdon constituency can be found at the Commissions website link below. Do you think the boundary changes are a good idea, grounded in common sense or pragmatism? Or are you against the proposal like Cllr Mills? The consultation is once again open to the public until 11th December 2017. This changes the political landscape until the next review so whatever your point of view we would suggest that you comment on the proposals. 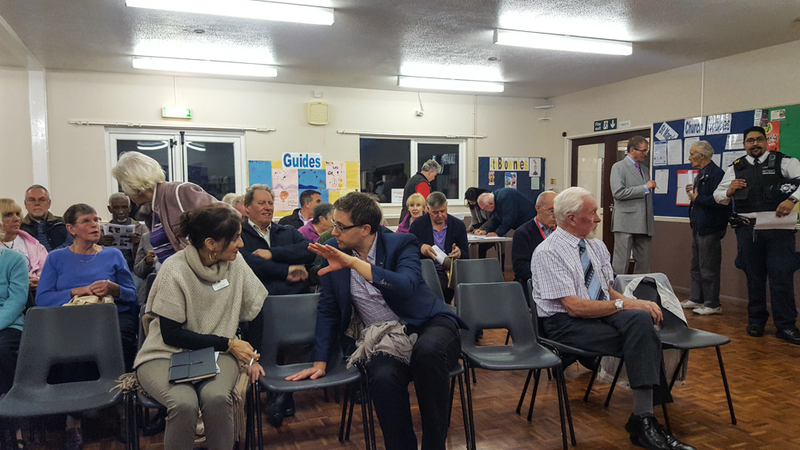 Quarterly Meeting Held at St Mary’s Church On Wednesday 25th October 2017. Before the start of the meeting 2. In attendance were 59 residents and 9 committee members. Councillors present Cllrs Barnes and Kauffman. Apologies were received from: Kate Fennel, Hazel Hook, Frances Jones, Geoff Quantock, Jagjit Sohal, Jenny Hunt, Cllr Lavey and Cllr White, Cllr Kelly and Duducu, Geoff Quantock. 15 Shoplifting, 1 Bike Theft. 189 in total. The ward crime team in South Ruislip is down to one officer and one PCSO with a further PC joining the team this week. Much lower than the five the ward used to have, which the officer lamented. What are the clear up rates? Unknown. Low clear up for motor vehicle without CCTV not investigated without further evidence 9 out of 10 times it gets closed. They are likely to merge three boroughs police forces to cut costs. How will you travel? 3 unmarked vehicles in Ruislip. Not enough for the number of officers. Likely to cycle. There are not enough vehicles to support the officers. Who use cycles, quite possibly to cycle from Hayes. They are likely to start off in local areas and march out from the library. They don’t know where their locker rooms etc will be. Cllr Teji Barnes raised the recent meeting at the council with MOPAC. The entire borough does not want this initiative. Discussed MOPAC initiative to shut Ruislip and Uxbridge police station. Lynne Kauffman praised a number of people who responded to the proposal and suggested people. The PC raised concern about any of the police stations which will impact on response times. What is causing much of the issues at the moment? Worse issue is kids on cycles causing issues. A lot of cycling on the ARLA Dairy site especially at ASDA. Distraction thefts. Are they local children? They come from Hayes, Harrow, Ealing and the ramp and cinema are attracting them in. The police have seen a large influx. The PC has visited the parents of the children. Cycle crime is more of an issue in the neighbouring wards than moped crime. Disappointed with the response from security at ASDA. Are you getting more officers to help support? No. Getting seven or eight calls a day from the site. The onus is on security at the site. The police don’t cover the site as private land. Norfest went very well and Sid thanked the committee members who attended. ALRA development award from RICS for the site, the award goes forward to a national prize. Current account £991.44 and £12,366.43 in the reserve. Expenses to come at £215. Complaint about vehicles being unloaded for sale on the site and set for sale from Victoria Road. Seen as not adopted by council so not their issue. Open before March. No move on this. Further roadworks to be done. What about the building used for worship behind? Still seeing movement in the area. But not large groups seen. Planning and appeal for worship at the site rejected. Work started. Drilling bore holes for the tunnels in the area Harvil Road, Rabournmead, Bridgewater Road, Sainsburys Car Park, Great Central Avenue and Herlwyn Avenue. Expect to start work properly at the end of next year. 10.0 RAF Northolt – James Tenniswood. What is happening? Many flights, due to Brexit, 5 people went to Caribbean moving the aid packages and water. No plans to expand the commercial operation out of RAF Northolt and no plan for bigger aircraft and no increase in cap for flights. There is a change in the resurface work on the runway which will now take place from July to November/December. Fixed wing traffic will cease. Rotary aircraft (helicopters) will stay and may increase when moving VIP’s around. Whilst working on the runway they are improving the arrester bed at end of the beds. Really looking at strengthening the beds. Main work is strengthening the middle part of the runway where it is weakest. Discussed the wider uses of the site. Varied environment 32 supported units, map making, two bands, Queens colour squadron, BFOS Post office, bomb disposal and many more. Service prosecuting authority. About 2000 people there and only 600 are RAF. The runway is only 5% of the services at RAF Northolt. Not able to accept scheduled flights. Not geared for it. As a military base they have to be able to cancel flights as it is used by specialist agencies this would not work with scheduled flights. No customs, gates, terminals, parking to cope etc or fire crews. They will have large military aircraft in such as the C17. They believe there is a crashed WWII Hurricane which they will try to recovered and excavate but pressure to complete the runway ASAP. Very good of James Tenniswood to come in on his own time. 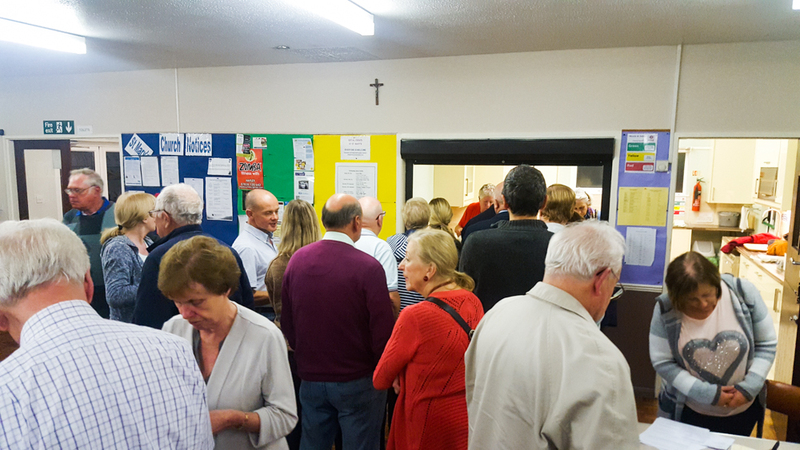 Open Evening last week, applied for planning permission for change to a sports club. This will be opposed by Hillingdon Council and ourselves. The officer opposing is keen to show any experiences that they have that highlight issues that you have had. Please send via email to the SRRA and we will forward on. Funding aside for roads, Broadhurst, Whitby Road around the shops, Hunters Hill, Southbourne and Greencroft and a limited number of pavements in the area. Mount Pleasant, Ridgeway, Oxford Drive and Newnham Avenue. Looking at getting the clock working at Field End School following Frances Jones suggestion. This will be done using the ward budget. Looking to keep the original design. Regular fly tipping at Church near Whitby Road. Keen to report the action. Cllr Barnes keen to use mobile cameras to tackle the issue. Three Road Stewards are retiring. Looking for people for Mount Pleasant. One for Palace Road and Diamond Road and one for 76-170 Long Drive and Fairview. By the way – subs do not include free teas! Disappointed by cycleway merging with pavement as proposed by the council from Station Approach to Polish War Memorial. Designated as joint path bikes and pavement. Petition raised by Doug Lewington, with around 140 signatures going to be presented to Democratic Services by Cllr Kauffman to have this reconsidered. Concern it is dangerous, the footpath is not wide enough. Sanjay from the Car Shop in Ruislip Parade spoke, introducing Sarah from Simply Flowers and Shahin from Ruislip Stars. The SRCoC traders needed to pull together to combat the threat from the new trading site and to speak to the council together so have just launched the South Ruislip Chamber of Commerce. Sarah discussed their passion to bring Christmas to South Ruislip, with a carol service and Father Christmas in the parade outside the shops. The wanted help with car parking especially the public car park next to Sainsburys. The car park is used by commuters. Keen for spaces to be used for people who will shop locally. Cllr Allan Kauffman said this was work in progress to change 15 bays for local shopping. Discussion on keeping the road and pavement clean. The council are not sweeping after replacing the pavements whilst this dries out. Concern a heavy sweeper will disrupt the paving slabs. Lynne mentioned that there is a monthly litter pick scheme if people wanted to join this. They promoted cleaning the paving in front of the shops encouraging owners to take ownership for these areas. On the subject to South Ruislip improvements, Cllr Allan Kauffman then went on to detail the improvement scheme to the shopping area of South Ruislip which is in three phases. From the nursery to the chip shop then under the bridge and to the plumbing centre finally. The improvements to the area include benches, bins, trees and other improvements. Further from the Cllr: Christmas lights, set to improve this year: Spending £13,300 Ruislip £8,000 and £13,017 in South Ruislip. 36 columns being decorated. Installed on the 6th and 7th November and switch on the 13th November. Road will be resurfaced. Queens Walk, Fairway and Victoria Road and Station Approach. Contact Allan if any roads missed. Consultants working on the bridge improvement plans at South Ruislip including such as cladding, light and walkway raised. Noted a further strike on the bridge, this time by a lorry from Spar. Victoria Road. Sid has written to Cllr Burrows (Traffic) Proposal for parking on the road to be unveiled following plans by the council. Sid thought that the only way forward is to widen the road space and allow parking in the verges. No right turn into West Mead and the filter into the ARLA site not working. Raised as an issue within the council. Sid as Chair thanked the SRCoC for attending. Colin promoted the litter picking on a Saturday morning once a month in the area. Colin picked up two bags of litter in a short distance. Concern about fly tipping in the car park opposite the Middlesex Arms. Sid mentioned Greggs bags dumped by Queensmead students on the way to school. Geoff Taylor suggested when the runway is closed work can be done at West End Road. Should be resurfaced by TFL then suggested to Cllr AK. Traffic headed to West End Road on Station Approach – facing long delays. Lights will be reviewed by council as part of the whole process as the ARLA centre is opened and Cllr AK said they will be improved. 12th of November Polish War Remembrance Service. RAF Padre to take the service. All welcome. Choir from Bourne School, drama students and other people coming. Service start 10.30am, arrive at 10.15. Details on the website. There are a number of residential roads not covered by Neighbourhood watch in the area. The coordinator will send a list of these to us and we will ask for support from our members. Discussion on Boris Johnson attending the SRRA meeting in the future. Pencilled in for 2018. It is likely to be a 4pm start on a Thursday or Friday. We will prioritise the regular attendees to come to the meeting. Meeting Closed at 9.40 pm. We have just posted the minutes from the last quarterly in July. Plenty happening in the area with HS2 and news on the field opposite Field End School on Field End Road. No more Thunderpark! The minutes can be found over here. Sorry for the delay in getting them out this time! Boundary Review: What is right for South Ruislip? 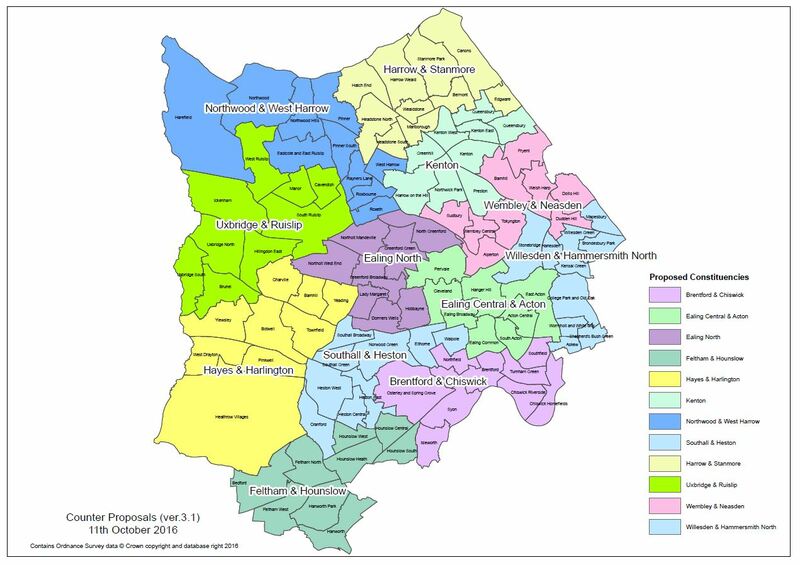 The boundary review is a national review aiming to bring MP’s constituency size to a more uniform, and reduce the number of MP’s and has recommended changes which could affect South Ruislip and the wards that make up the seat. Cavendish and South Ruislip wards which the SRRA covers, currently form a constituency with Uxbridge. And that has changed in recent times. However the boundary review is proposing a change to include with the Hillingdon and Uxbridge constituency the Ealing wards of Northolt West End and Northolt Mandeville. We see our MP’s being better able to represent us when they come under one council, namely the London Borough of Hillingdon and not tagged on with a small part of Ealing to make up the numbers. Thus we support the council’s counter proposal of a seat which includes other parts of Ruislip. For a more detailed discussion of the debate on the boundary change it may well be worth watching the recent Council meeting from early November where this is debated. Skip to 58 minutes for this part but being able to see local democracy in action is well worth a watch. These are our thoughts but whether you agree or disagree we would encourage you as local residents to let the boundary commission know what your feelings are on the subject. Closing dates for submissions are the 5th December so get cracking.